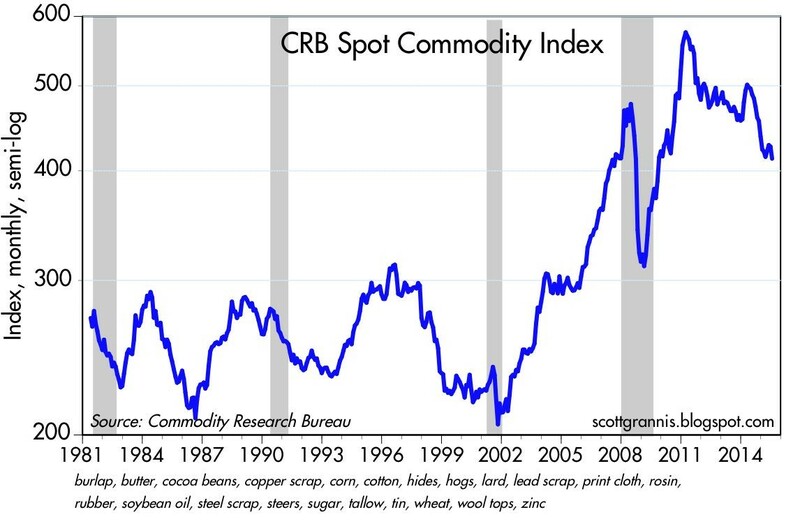 Commodity prices, including oil, are “crashing” according to the pundits and fears are building that this is a precursor to another stock market collapse. Are we on an irreversible path of repeating the bloodbath carnage of the 2008-2009 Great Recession? Fortunately for investors, markets move in cycles and the fundamental laws of supply and demand hold true in both bull and bear markets, across all financial markets. Whether we are talking about stocks, bonds, copper, gold, currencies, or pork bellies, markets persistently move like a pendulum through periods of excess supply and demand. In other words, weakness in prices create stronger demand and less supply, whereas strength in prices creates weakening demand and more supply. Since energy makes the world go round and the vast majority of drivers are accustomed to filling up their gas tanks, the average consumer is familiar with recent negative price developments in the crude oil markets. Eighteenth-century economist Adam Smith would be proud that the laws of supply and demand have help up just as well today as they did when he wrote Wealth of Nations in 1776. It is true that overall stagnation in global economic demand in recent years, along with the strengthening of the U.S. dollar (because of better relative growth), has contributed to downward trending oil prices. 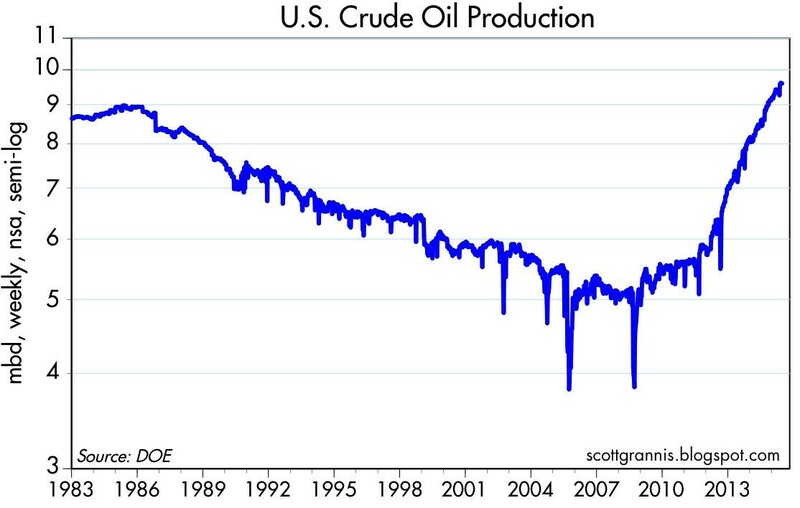 It is also true that supply factors, such as Saudi Arabia’s insistence to maintain production and the boom in U.S. oil production due to new fracking technologies (see chart below), have arguably had a larger negative impact on the more than -50% deterioration in oil prices. Fears of additional Iranian oil supply hitting the global oil markets as a result of the Iranian nuclear deal have also added to the downward pressure on prices. 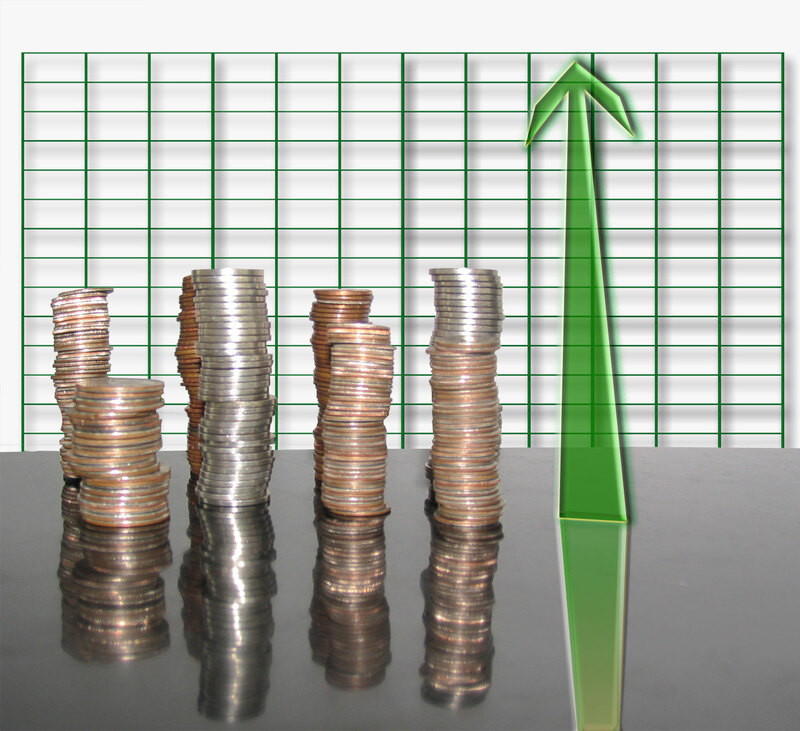 What is bad for oil prices and the oil producers is good news for the rest of the economy. Transportation is the lubricant of the global economy, and therefore lower oil prices will act as a stimulant for large swaths of the global marketplace. Here in the U.S., consumer savings from lower energy prices have largely been used to pay down debt (deleverage), but eventually, the longer oil prices remain depressed, incremental savings should filter into our economy through increased consumer spending. But prices are likely not going to stay low forever because producers are responding drastically to the price declines. 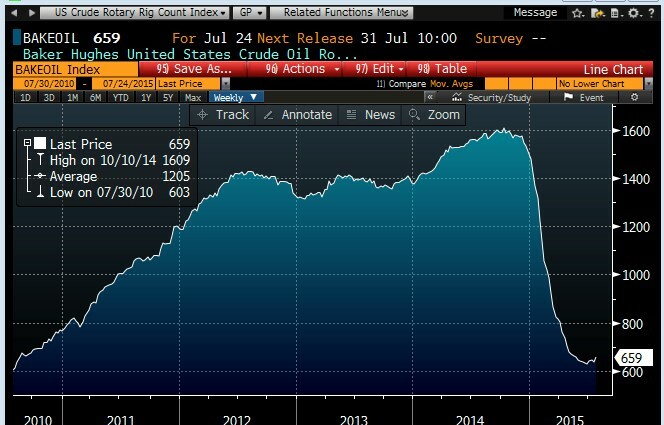 All one needs to do is look at the radical falloff in the oil producer rig count (see chart below). As you can see, the rig count has fallen by more than -50% within a six month period, meaning at some point, the decline in global production will eventually provide a floor to prices and ultimately provide a tailwind. If we broaden our perspective beyond just oil, and look at the broader commodity complex, we can see that the recent decline in commodity prices has been painful, but nowhere near the Armageddon scenario experienced during 2008-2009 (see chart below – gray areas = recessions). Although this conversation has focused on commodities, the same supply-demand principles apply to the stock market as well. Stock market prices as measured by the S&P 500 index have remained near record levels, but as I have written in the past, the records cannot be attributed to the lackluster demand from retail investors (see ICI fund flow data). Although U.S. stock fundamentals remain relatively strong (e.g., earnings, interest rates, valuations, psychology), much of the strength can be explained by the constrained supply of stocks. How has stock supply been constrained? Some key factors include the trillions in dollars of supply soaked up by record M&A activity (mergers and acquisition) and share buybacks. In addition to the declining stock supply from M&A and share buybacks, there has been limited supply of new IPO issues (initial public offerings) coming to market, as evidenced by the declines in IPO dollar and unit volumes in the first half of 2015, as compared to last year. 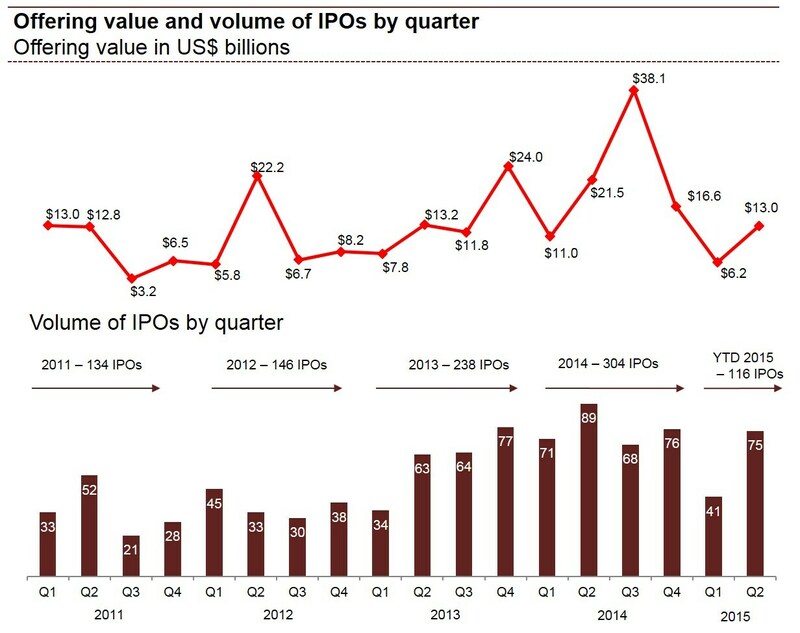 More specifically, first half IPO dollar volmes were down -41% to $19.2 billion and the number of 2015 IPOs has declined -27% to 116 from 160 for the same time period. Price cycles vary dramatically in price and duration across all financial markets, including stocks, bonds, oil, interest rates, currencies, gold, and pork bellies, among others. Not even the smartest individual or most powerful computer on the planet can consistently time the short-term shifts in financial markets, but using the powerful economic laws of supply and demand can help you profitably make adjustments to your investment portfolio(s). Entry filed under: economy, International, Themes - Trends. Tags: Adam Smith, bonds, copper, currencies, economics, gold, IPOs, Iran, M&A, pork bellies, Saudi Arabia, Stocks, supply, supply and demand.